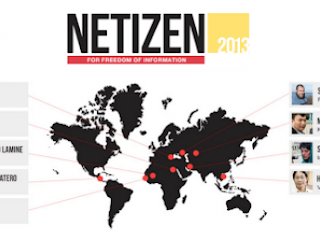 Huynh Ngoc Chen has received the 2013 Netizen award from the freedom of expression defense Association Reporters without Borders (RSF) and Google. This Vietnamese blogger does not hesitate to criticize the Vietnamese government on his blog, which receives 15,000 visits every 15 days, despite Hanoi authorities, severe censorship of the, has over. He was elected among nine nominees on RSF YouTube channel by 40,000 users. “This award means a lot to me, this is a new source of inspiration. It is also and above all a reward and hope for bloggers and independent journalists in Vietnam,” said the winner, after the announcement of its award accompanied by a check for 2500 euros. Huynh Ngoc Chen had indeed seized topics such as human rights in his country and territorial disputes between Vietnam and China in the East Sea. According to Reporters without Borders, these positions have made him be followed and bugged by the Vietnamese authorities. His site is also blocked and is accessible from Vietnam only through a VPN service to go anonymously on the Internet. This award is also an opportunity for RSF to pinpoint the censorship that exists in Vietnam and the strict control that the government exerts on the Web. This country is indeed ranked at the 172nd position out of 179 in the latest worldwide index of press freedom published by RSF in January 2013. “The players of online information, bloggers and net citizens in Vietnam have faced an intensified crackdown in the last few months,” RSF said in a statement issued while announcing the award. Out of 14 dissidents who have been sentenced to prison in early January, nine were cyber-activists. As a partner of the Net citizen-award since 2010, Google says its support to this initiative, as its products are “blocked in 25 of the 1114 countries where we deliver our services,” said William Echikson, head of Google’s freedom of expression for Europe, Africa, and the Middle East. To bypass censorship in your country of residence and be able to connect to your choice websites, choose a VPN service that makes your Internet connection completely anonymous. You just have to select a VPN server in one of the 114 countries. You can access blocked websites but also protect your Internet activities with a secure VPN tunnel including virtual military encryption. VPN Installation is simple and takes less than 2 minutes. Buy a VPN service or test our free VPN trial.